Le Clocher winery was founded officially in 1995, but has been in the family of Danilo Charrere for many generations mostly producing wine for personal consumption. The real passion was passed on to Danil by his grandmother Eulalia who taught him ‘to love this job and teaching me her skills’. Mattia Nicoletta is the consultant winemaker. The vineyards total about 4 hectares and are from 600 – 900 meters asl. 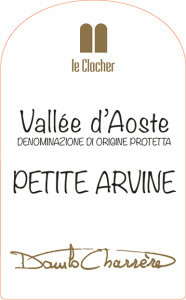 With most estates in the Valle d’Aosta producing wines from cooperative growers, Le Clocher is an estate that owns and maintains their own vineyards. Natural organic fertilizers are always used and care of the environment is most important. Only when absolutely necessary are pesticides applied and never toxic products. The vineyards are all very small pieces and very old, the oldest is a vineyard of Petit Rouge that is about 80 years old. Over the years they began to weed out and to refurbish these old plots trying to assemble as much as possible to get the greatest vineyards and thus the best to work with. Viticulture Aosta Valley is by many considered a heroic venture precisely because of the strong slope that does not allow them to mechanize the vineyards. Most of the plots that they work are in Jovencan, which is where they are located, others are in the adjacent town called Gressan. The Valle d’Aosta is the smallest wine producing region in Italy. The harvest is made by hand harvesting the grapes and putting it inside the baskets which are then emptied gradually in the boxes that are then placed on a trailer. The vinification of the wine begins with meticulous sorting to ensure optimum fruit thereby producing the best wine possible. This alpine white wine originated in both Switzerland and the Valle d'Aosta. It is made with local yeasts collected by the local agronomy school. It has notes of apples and pears mixed with a solid backbone of good acidity and striking minerality. 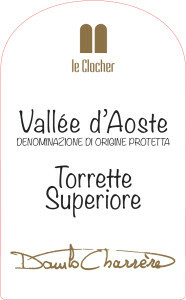 Torrette Superiore is made up of 100% Petite Rouge aged for 12 months in 300L French oak casks. The vineyards sit at over 8oo meters asl and the soils sit on granite and are a mix of sandy and aluvial soil. Wild yeast fermented, this is a natural wine with as little intervention as possible. Stainless steel aged. Pinot Noir DOP here is the international variety par excellence that comes to 850 meters. 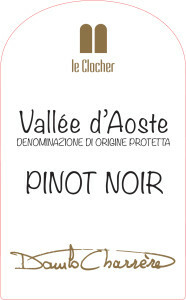 The Pinot noir, like Gamay, is a native of Burgundy, in France; Valle d'Aosta has been introduced in the late 60's. It has a pale red, and flavors of black cherry and raspberry, the scent of violets and other small mountain flowers make it balanced, refined and elegant. white meat, red, cheese and pasta dishes. Do to the long hang time the fruit reaches optimal ripeness. Wild yeast fermented, this is a natural wine with as little intervention as possible. Stainless steel aged. 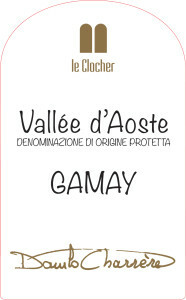 Gamay DOP: Gamay is originally from Burgundy, France; in Valle d'Aosta it has been introduced in the late 1960's. The grapes to produce this wine come from vineyards planted on the right bank of the Dora Baltea, in the municipalities of Jovençan and Gressan. The vineyards are located between 650 and 800 meters s.l.m. and they are subject to steep slopes. Color: Very bright ruby ​​red color. Aromatics: The nose will perceive aromas of wild strawberries. Palate: Red berries mixed with herbs and strong personality of minerals and stones. It is a fine wine and not too demanding suitable for aperitifs that full meals daily. It is often used for picnics in the company. gently accompany this sublime wine. 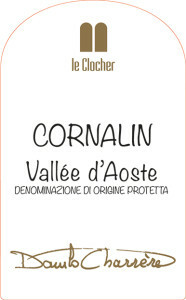 Cornalin is a native vine in the Valle d'Aoste, the first strains gathered were cultivated just near the town of Jovençan where Le Clocher is located. 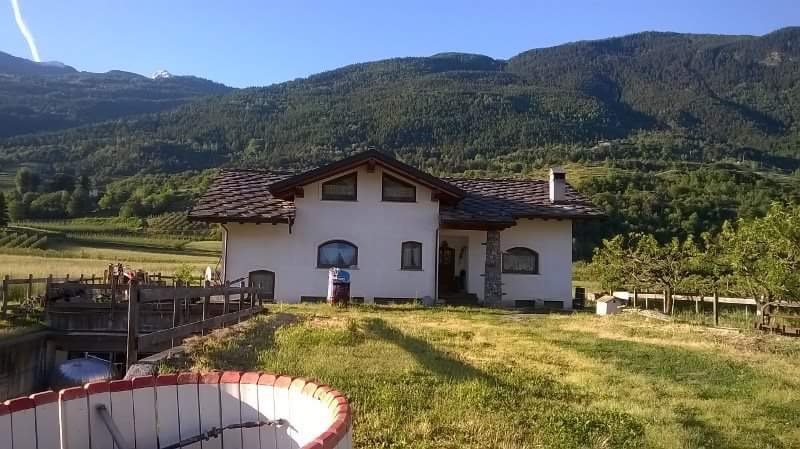 The best results they've had are with vineyards that are located at 800 meters above sea level, facing north with steep slopes and with good sun exposure. It is a difficult grape to work with because it produces much vegetal growth and needs to be monitored for constant pruning but once harvested the wine produced is beautiful. Hand harvested and then fermented in steel which is then aged in steel barrels for about a year then bottled aged for at least 6 months. The harvest of the Cornalin is late for this cool climate, somewhere around the 3rd week of October. Cornalin DOP: this native vine has a ruby color with purple hues ... intense, complex and fine! The floral and fruity aromas blend gently with the full flavors and spices. The low tannin and freshness lasting on the palate makes this a versatile wine for many dishes at the table. 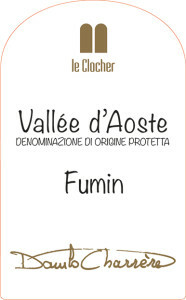 Fumin is a native grape varietal from the Valle d'Aosta that takes its name due to its unique features and smoky notes. The vineyards plots are located approximately 750 meters above sea level. Fumin unlike other varietals is very difficult to work in the vineyard due to the extreme delicacy of the branches, in fact during the operation of trellising in the spring it is recommended to go in times of high humidity or even in the rain so that the wood of the branch is softer and therefore there is less risk of breaking it. Even in the cellar it is much more delicate, and requires more racking with respect to other reds because it tends to form many more residues dregs. Vintage takes place from October 25 to November 5 , this tardiness is deliberate because it is a wine that in order to to be great must undergo a period of intense cold before the harvest in order to bring out its aromas and to soften its tannins. Fumin is aged for 12 months in tonneaux casks and then bottle aged for at least 6 months. • Fumin is very age worthy due to its particularity given the intense fragrance of alpine flowers and good tannins and acidity. On the palate the wine was medium to full bodied with medium acidity. Dark fruit flavors like blackberry, blackcurrant, blueberry with unmistakable smoky notes. The native yeasts used are selected by the Institut Agricole Regionale [the local wine school and research center in the area]. Best served with roasts, braised meats and aged cheeses.